Today we have movie stars who hail from all over the world, but back in the 1930s it was unusual to have anybody in films who was from another country. Inroads were made when beautiful Dolores Del Rio became a popular favorite in films such as Ramona (1928) and Flying Down to Rio (1933). She was born in Durango, Mexico. Rudolph Valentino, of course, was an Italian lover type, and Ramon Novarro and Gilbert Roland headed up the Latin hotties of male stars. Pola Negri, of Poland, was the first European actress to be invited to star in Hollywood silent films. Following her was Vilma Banky of Hungary, who also made a name for herself in silents. 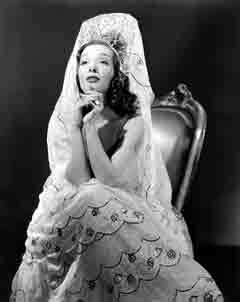 Lupe Velez was a tiny thing – just barely five feet tall – but she seemed to be born with firecrackers in her tummy. She came roaring into life on July 18, 1918 to her mother Josefina, a vaudeville singer, and her father Jacobo Villalobos Reyes, a colonel in the armed forces of Mexico. When as a young girl Lupe showed an interest in performing, her father was outraged and forbid his daughter from being in show business. Her father’s objections meant nothing to the headstrong Lupe, and she proceeded to seek out venues where she could dance the then-popular “shimmy.” In 1925 she was cast in the big stage revues Mexican Rataplan and !No lo tapes! and became a big audience favorite. The following year American Frank Woodward contacted stage star Richard Bennett (father of American film stars Constance and Joan Bennett) about Lupe. Bennett was looking for a Mexican cantina singer for his new play. Lupe traveled to Hollywood but was rejected for the part for being too young. While in Hollywood, Lupe met film and stage comedienne Fanny Brice (whom Barbra Streisand played in Funny Girl many decades later). Ms. Brice could spot talent and she took a liking to Lupe because of her sparkling personality. She put in a good word for Lupe to impresario Florenz Ziegfeld, who could use Lupe in one of his Broadway musicals. However, just before Lupe was ready to chuck it all and move to New York, fate intervened. MGM Producer Harry Rapf offered Lupe a screen test. When Comedy King producer Hal Roach saw the test, he signed Lupe to a contract to appear in some short films. The first one was a Laurel and Hardy comedy, Sailors, Beware! in 1927. Ms. Velez made her major film debut in Douglas Fairbanks’ action-romance The Gaucho also in 1927. The film was a huge hit and Velez was a sensation in her debut, becoming an overnight star. During her rise to stardom, she was active on the romantic front as well. Being high-spirited and overflowing with hormones at ages 19 and 20, Ms. Velez sought out some of Hollywood’s hottest men. One of her first conquests was cowboy star Tom Mix. Tall and strong, Mix was catnip to Velez. Although he was in his mid-forties and twice Velez’s age, his appeal was physical. Their romance ran its course as Mix’s film career started to slide. Mix died tragically in a fiery crash in 1940 when his racy white Cord convertible ran off the road in Arizona. Never one to sit still, Lupe set her eyes on the young and handsome Clark Gable, newly arrived in Hollywood. Gable, himself, cut off their romance because he was afraid Lupe would run all over town discussing their sexual secrets. She did. One of the best kept secrets was that Lupe was having a torrid affair with comic genius Charlie Chaplin in 1928. Lupe revitalized Chaplin’s libido after he had gone through a torturous divorce from his wife. Again, although Chaplin was twice her age, she inspired him to rise to the occasion. Lupe actually did some acting during her sexual escapades. She filmed Stand and Deliver for famed director Cecil B. DeMille in 1928 and starred in director D.W. Griffith’s Lady of the Pavements in 1929. She hated co-star Jedda Goudall, and the two had a ferocious cat-fight on the set. Velez’s hot temper came to the fore once again. Although her reputation for being “hot-headed” was well-known, it didn’t deter male lovers from hovering around like a bee to honey. When she was cast in the film The Wolf Song in 1929, she began her first widely publicized romance with the young and luscious Gary Cooper. Cooper, 28, was tall and lanky at 6’3” and was raised in Montana. He towered over Lupe, 20, but she didn’t mind. Veteran Hollywood writer Adela Rogers St. Johns wrote, “It seemed so funny, tiny, tempestuous Lupe and six-foot-three of slow-moving Cooper: her fire-cracker Mexican accent and her sparkling laughter against the slow drawl and slower smile of the big cowboy; Lupe’s public demonstration and declarations of love and Gary’s embarrassment and adoration.” Their two-year relationship, however, was fraught with massive fights in which Lupe was the aggressor and who physically attacked Cooper. The rugged star became a physical wreck, causing him to lose weight and have a nervous breakdown. His home studio, Paramount Pictures, granted him a leave of absence so he could recuperate. At the train station, Lupe stalked Cooper and shot at him with a pistol as he was getting onto the train. Cooper couldn’t depart fast enough and managed to dodge the bullet as he leaped into the Pullman. That was the end of their torrid affair. 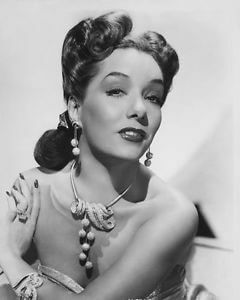 However, Cooper is quoted in Floyd Connor’s book Lupe Velez and Her Lovers as commenting years later that, “I guess I was in love with Velez as much as one could get with a creature as elusive as quicksilver. She flashed, she stormed and sparked…” Ms. Velez gave Cooper an offhanded compliment by saying, “He has the biggest organ in Hollywood…” One wonders if it was a Wurlitzer. Lupe had made her talking picture debut in the film Tiger Rose with dog star Rin Tin Tin back in 1929. She followed that with director William Wyler’s The Storm (1930) co-starring William Boyd (with whom she had an affair before he became “Hopalong Cassidy”), and The Squaw Man (1931) for Cecil B. DeMille. Taking a break from Hollywood in 1932, Lupe was signed by Broadway impresario Florenz Ziegfeld to play Conchita in the musical revue Hot-Cha!. Co-starring were comic Bert Lahr (later the Cowardly Lion in Wizard of Oz), Eleanor Powell (who danced her way to stardom in later MGM musical films and married Glenn Ford), and Buddy Rogers (who married silent star Mary Pickford after she dumped Douglas Fairbanks). The show closed after 119 performances and was the final show produced by Ziegfeld. Lupe was up to more of her evil shenanigans when beautiful actress Estelle Taylor co-starred with her in East is West. The girls became best friends during the filming. When Heavyweight Champion boxer Jack Dempsey fell madly in love with Taylor, the two got married. Lupe was now on a campaign to break up that marriage, which she did in subtle ways. Apparently Lupe and Dempsey had been canoodling before he met Taylor. He abruptly cut off their relationship, and Lupe never forgave him. Hell hath no fury like a woman scorned, to coin a phrase! Lupe had a thing for fighters. She was also ahead of her time. She conducted a flagrant, but secret, affair with black boxer Jack Johnson. In those days, blacks and whites almost never conducted sexual affairs out in the open. She was a wild one for sure. But Johnson was somewhat of a showman himself. Proud of his manhood, he would wear skintight trunks and wrap his elephant-sized endowment with gauze to make it appear even bigger in the ring. Ringling Bros. weren’t the only ones proud of their outsized elephant trunks. Johnson was a hoot. Lupe was never at a loss for male companionship. Around 1932-33 she met the young Adonis Randolph Scott. He was new on the scene and catnip to the rambunctious Lupe. She lit up, he lit out and left her for Cary Grant. He and Grant lived together for more than ten years! The Latin bombshell met Olympic swimming champion Johnny Weissmuller at the hotel where she was staying that was owned by film star Marion Davies. Weissmuller had won four Olympic medals in the 1924 Games and then another four in the following Olympics. He set 67 swimming records. The Romanian-born athlete was 25 years old, 6’-3” tall with the body of a Greek God. He was just what Lupe wanted. There was one problem – Weissmuller was already married. MGM had spotted him and knew he was perfect to play the lead in Tarzan, the Ape Man. Weissmuller dumped his wife and he and Lupe were married October 8, 1933 in Las Vegas. They immediately started fighting and separated after four months of wedded bliss. They reconciled even though Lupe was a night owl and Johnny was a day person. They constantly battled and Lupe usually beat him to a pulp. Lupe filed for divorce several times in 1934 and changed her mind. Finally, in 1938 she filed a petition that was finalized in 1939. Weissmuller’s patience was so strained he dumped a plate of salad on her head at the fabulous Ciro’s nightclub. The battling Weissmuller’s were finally divorced. Lupe was no longer swinging on Tarzan’s vine. MGM had renewed her contract back in 1934, and the decade provided Lupe with many hit pictures. Many of her films were comedies, and she starred with Jimmy Durante in four hit pictures. Unfortunately, after she made Hollywood Party with Laurel & Hardy, Jimmy Durante, The Three Stooges, and Mickey Mouse, MGM unceremoniously dropped her. The excuse was that the studios were no longer going to make Spanish versions of their films and there was no longer a need for Latin actresses. It was the first time Lupe was without a studio contract and she felt adrift. Being let go by MGM turned out to be the best thing that had happened to Lupe. After appearing in several pictures to round out the 1930s decade – including some made in her native Mexico – she was offered a role that would change her life. That role was of Carmelita Lindsey in a 1939 RKO “B” picture called The Girl From Mexico. She was co-starred with bald comic Leon Errol and handsome Donald Woods. Despite its lowly status, the picture became a tremendous hit with audiences. 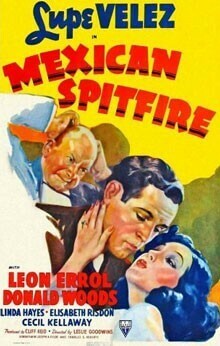 RKO rushed them into another film, this time called Mexican Spitfire, an appellation that was applied to Lupe herself because of her volatile nature. Her character of Carmelita was an emotional singer who was temperamental to the other cast members, including her husband Dennis (Wood), a wealthy American businessman. The 1940 film became another smash for Lupe. The Spitfire series of eight slapstick comedy films rejuvenated Lupe’s sagging career. This led to being cast in several musicals and comedies for other studios such as Six Lessons from Madame La Zonga (Universal, 1941) with Helen Parish and William Frawley, Honolulu Lu (Columbia, 1941) in which she is an entertainer in a nightclub that caters to sailors Forrest Tucker and Lloyd Bridges, and Redhead From Manhattan (Columbia, 1943). The early 1940s were Lupe’s peak period and she was back on top with the low budget series, which included Mexican Spitfire Out West (1940), Mexican Spitfire’s Baby (1941), Mexican Spitfire at Sea (1942), Mexican Spitfire Sees a Ghost (1942), Mexican Spitfire’s Elephant (1942), and Mexican Spitfire’s Blessed Event (1942). During this period she worked with some of Hollywood’s greatest comic talents, including daffy ZaSu Pitts, Patsy Kelly, William Frawley, Leo Carillo, and Eddie Albert. Lupe’s well-known tempestuous romances and her violent temper made her a favorite of the tabloids and movie magazines of the time. She was always in the headlines, most of which was bad publicity and didn’t help her career. She was romantically linked with Gary Cooper, Charlie Chaplin, Clark Gable, cowboy Tom Mix, Tarzan Johnny Weissmuller, Errol Flynn, John Gilbert, Cecil B. DeMille star Henry Wilcoxon, singer Russ Columbo, Randolph Scott, author Erich Maria Remarque (who wrote All Quiet On The Western Front and later married beautiful film star Paulette Goddard), Clayton “Lone Ranger” Moore, director Victor Fleming (Gone With The Wind), and boxers Jack Johnson and Jack Dempsey. An example of how tempestuous Lupe was, in 1943 she announced her engagement to actor Arturo de Cordova, her co-star in the Mexican picture La Zandunga (1938). This also caused a sensation because de Cordova was a married man with four children. Lupe, by any stretch of the imagination, was not at all discreet about her love affairs. Although no one knew it, Lupe’s last film was Nana, a Mexican version of Emile Zola’s classic story, made at Aztec Studios in October 1943. At this same time Lupe took on another lover in the form of 27 year-old bit actor Harald Ramond. He was French and had participated in World War II as a Resistant fighter and had escaped the Nazis. He was a strong and controlling man who knew how to tame Lupe. Lupe discovered she was three months pregnant when she announced her engagement to Ramond without his knowledge or consent. When he learned of her pregnancy, he refused to marry her. She was deeply hurt and stunned because she knew her career would be ruined in Hollywood if word got out she was not married and was going to have a baby. It just wasn’t done in those days. Although Lupe’s manager tried to get Ramond to marry her to give the baby a name, he again backed out. Because Lupe was a devout Catholic, abortion was out of the question. She could see only one way out: suicide. After swallowing 70 Seconal pills, she lay down on her pink satin pillow on her over-sized Hollywood bed and arranged herself like a movie star, with her hands folded across her chest. Dramatic to the end, Lupe went out of this world in glamorous style.